Friends are important part of social life, so your users will always look for new friendship connections. To support this need, we create Members page in order for your users to browse all members and do actions on them. phpFox allows searching members by various conditions such as gender, ages, location, keywords as well as custom fields. Your users can interact with each other by going to profile page and do some actions as add friend, poke, send messages, gift points, block or report the user. Every admin wants to fully control their users such as edit their information, approve or deny some users or even ban users. We allow admin to manage all users of the site at AdminCP. Admin can also view some advanced information of each user such as last activity, IP address. Admin can approve, ban, verify, resend verification email or delete some selected users. 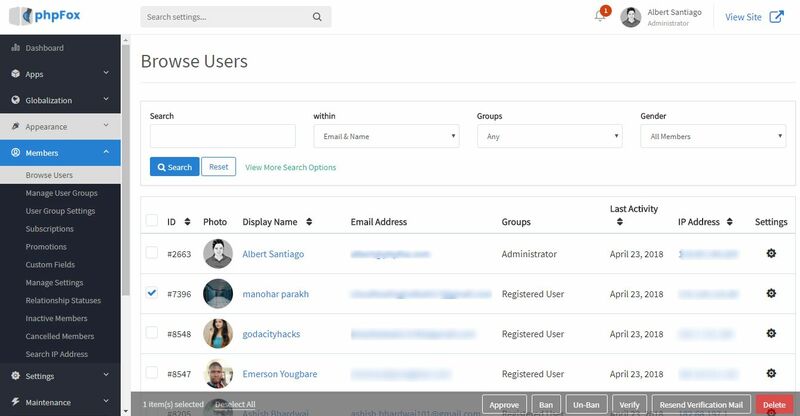 Admin can also change the user group of a specific member. Admin can highlight some members by featuring them. Featured members will be displayed at the Browse Members page.